Shepherds’ Pie is one of my favorite winter dishes, but it can be kinda heavy! I’m definitely not going to make it with ground beef, but I also like to avoid grains and beans if possible as well. 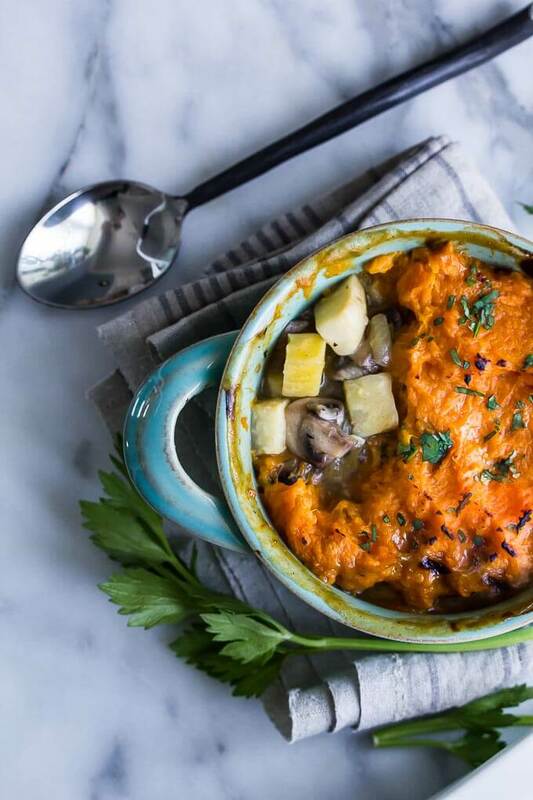 A warming casserole like this is a good vehicle for root vegetables, and here I decided to use celery root and sweet potato. Celery root (or celeriac) is a totally unappreciated vegetable. It’s pretty ugly! The skin is gnarly and I think that many people might be a little intimidated to approach it. The truth is it can be cooked like almost any other root vegetable. It’s pretty dense and will hold up to long cooking like braising, long sautéeing or boiling. It’s simmered here with the mushrooms and other vegetables in the pie filling. Celery root is also really nutritious-it’s high in dietary fiber and protein as well as many crucial vitamins and minerals. Celeriac has high contents of vitamins C and K, and various B vitamins such as, thiamine (B1), riboflavin (B2), niacin (B3), pantothenic acid (B5), and vitamin B6. It is rich with calcium, iron, magnesium, manganese, phosphorus, potassium, sodium, and zinc, Vitamin C, and potassium. The mushrooms give the dish a nice earthy flavor-I used shiitakes and button mushrooms but you can sub any of your favorite mushroom instead! In a medium saucepan, heat the coconut oil and add the diced onion and garlic. Sauté for 3 minutes until onion is translucent. Add the mushrooms, carrots, celery and celery root. Sauté until vegetables are barely tender. Add the white wine and cook until wine is reduced. Add the water, nutritional yeast and arrowroot powder. Bring to a simmer and cook 5-10 minutes until the mixture has thickened and the the vegetables are tender. Fill a medium saucepan with water to completely cover the peeled sweet potatoes. Cook on low until tender to the center (about 20-30 minutes). 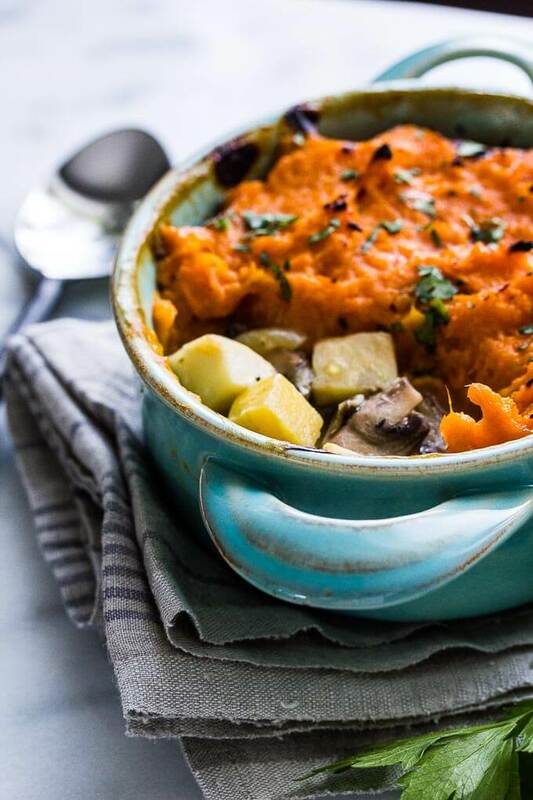 Drain and mash the sweet potatoes with a whisk (it's quite easy actually). Season with salt and pepper to taste and a splash of unsweetened almond milk if desired. Pre-heat the oven to 350 F.
Place the filling in an oven safe 9" x 9" baking dish. 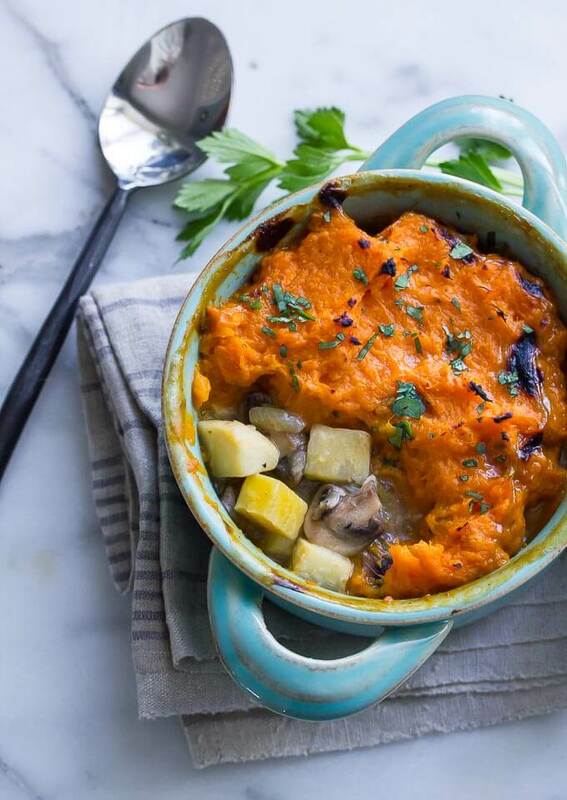 Top with a layer of the mashed sweet potato. 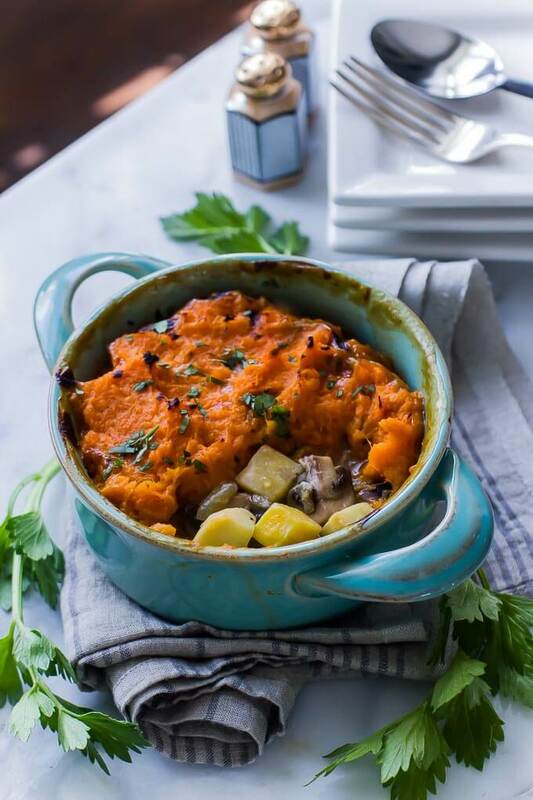 Place the dish uncovered in the oven for 15-20 minutes or until the center is hot and the sweet potato topping is gently browned. what would you serve with it, I am going to make it, it looks great, but I need a side to go with it, not a salad. Well, I think it would go nicely with crusty bread, quinoa, or rice. Roasted carrots are a nice vegetable option.